This simple and inexpensive device might just save thousands in water damage! 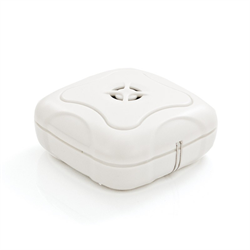 Place the water alarm anywhere you may expect a water leak, such as near washing machines, sinks, toilets, hot water tanks. When water touches the sensor, a loud built in 95 db alarm will sound, alerting occupants to a water leak or flood before it turns in to major damage. If you have an alarm or other system that can accept an external input you can also consider the WS-04E water siren with relay output. Or if you're looking for whole house protection with automatic shut off valve you can consider a Fortrezz ZWave water shut off kit with Zwave sensors. Alarm can sound up to 3 days with a full battery. Note: Someone must be within hearing range to act on a water siren. Water alarm must be in a location where water can touch the sensors. Battery lasts up to one year. Regular testing of operation and battery is recommended.